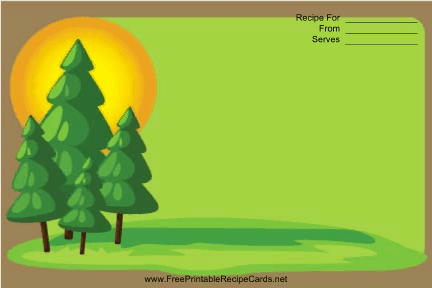 This Pine Trees Brown Recipe Card features several pine trees on a green hillside with a brown border. This recipe card is available in four versions. The free versions are lined: ready to print and write on, with your choice of 3x5" and 4x6" dimensions. The free versions are in .PDF (Adobe Acrobat) format. The $7 versions are unlined: you can use these to type recipes or paste them in from your favorite recipe web sites. (Example) These are available in Microsoft Word (.DOC) format, again in your choice of 3x5" or 4x6". You can print as many recipe cards as you need, with just one download. If you don't see a recipe card design or category that you want, please take a moment to let us know what you are looking for.